a. 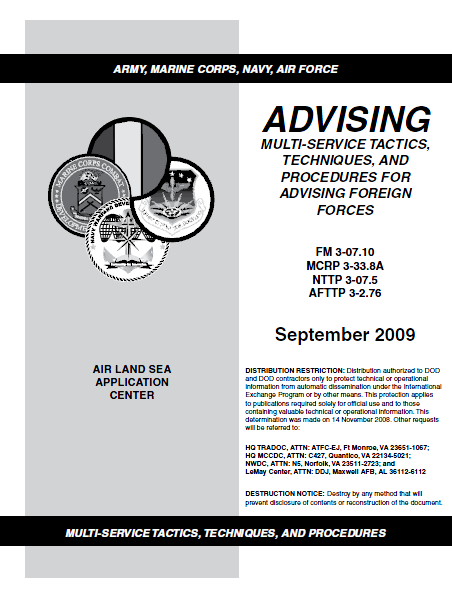 This MTTP publication is designed to help individuals and units that have been selected to advise foreign forces (FF). The FF term includes all personnel available to a nation for security to include: civil, federal, and military. For example; coast guard, firemen, police, border patrol, gendarmes, and military functions. Advising Foreign Forces (Advising) covers the principles associated with being an advisor and establishes a foundation for understanding the tasks in which an advisor must become proficient. According to Secretary of Defense Robert Gates, service as an advisor may well be the most important military component of the Global War on Terror. Serving as an advisor is both military science and military art. This MTTP publication describes some of both. It is aimed at the battalion team, but is applicable to advising at all levels. Advisors serving in ministries such as defense, interior, and justice will find this MTTP useful until specific instructions for national level service are produced. It is intended to apply in all theaters, but is obviously influenced by the current advisor missions in Iraq and Afghanistan. (1) Compliance-focused influence is based primarily on the advisor’s authority. Compliance is appropriate for short-term, immediate requirements and for situations where little risk can be tolerated. Compliance techniques may be appropriate for advisors when the FF is unwilling or unable to commit fully to a request. If something needs to be done with little time for delay, then compliance may be an acceptable approach. Compliance-focused influence is not particularly effective when the advisor’s aim is to create initiative and high esteem within the FF unit. The effects will only last as long as the advisor is able to affect FF unit behavior. (a) Incentives and Disincentives. Incentives and disincentives refer to the advisor’s ability to give things or take things away in order to change behavior. Behavior can be modified or changed by changing the consequences of the current behavior or by introducing new consequences (incentives or disincentives) that a subject receives for engaging in a behavior. (b) Increasing a behavior involves increasing the value of the positive consequences and/or decreasing the value of the negative consequences. 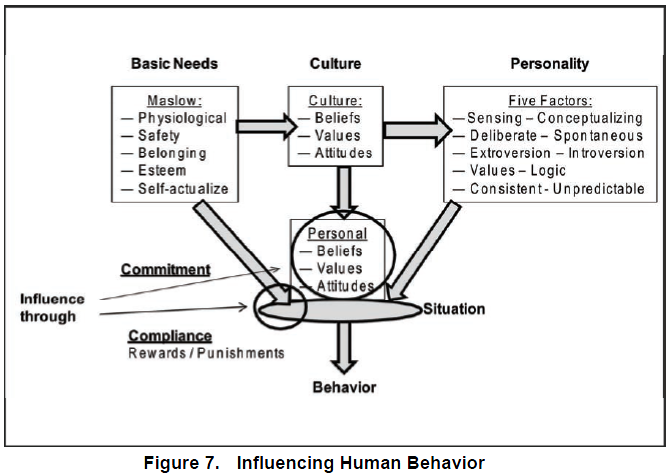 Introducing or emphasizing things in the environment that are desirable or pleasant when a person engages in the desired behavior, or removing things that are unpleasant when he engages in the desired behavior, are ways of increasing a behavior. (c) Decreasing a behavior involves devaluing or reducing the positive consequences and increasing the value of the negative consequences a subject receives. Removing something desirable or pleasant that is currently reinforcing a behavior, or introducing something into the environment that it is unpleasant, are ways of decreasing a behavior.